And the award for the weirdest, craziest, most mind-bogglingly boggled piece of the body goes to...THE EYE. The eye is often held up as the pinnacle of biological design. It's not. It's a backwards mess. An awesome backwards mess, yes. A useful and wonderful backwards mess, yes. But it's still a mess. There's all sorts of ways in which the eye seems like something that evolution bashed together during a hundred million bad days. It's amazing that it works at all. When you see something, what you're seeing is light reflected off objects and into the eye. 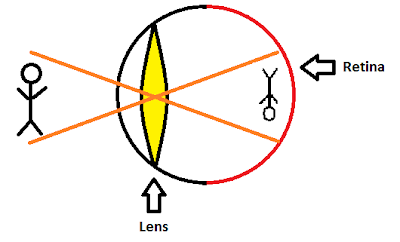 This light passes through a part of your eye called the lens. The lens focuses light, making images nice and sharp, and letting you see things that are close or far away. 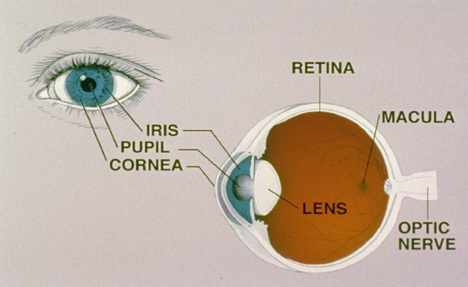 It focuses the light on the retina, which is a layer of neurons at the back of your eye. But because of the way the lens works, the image gets flipped, so what the retina sees is upside-down. The retina sends the picture to the brain. It's the brain's job to flip it so it's right-side-up again. Close up on the retina. From spie.com. The retina is made up of lots of cells. 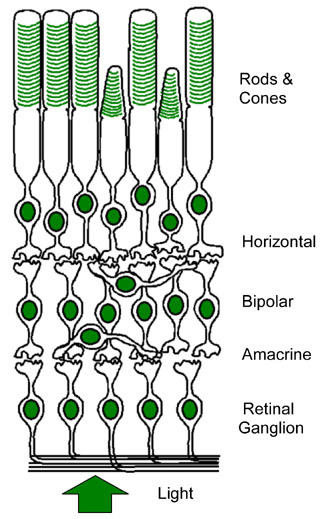 Some of these cells are specialized neurons called rods and cones. The job of the rods and cones is to sense light, and send this information on to your brain. But the rods and cones are at the back of your eye, as far away from the light as it's possible to get and still be part of the eye. 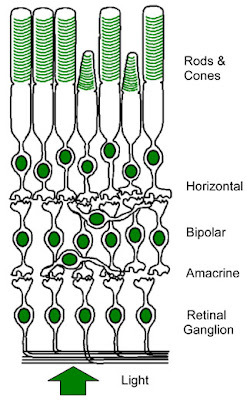 All the cells that the rods and cones connect with on the way to the brain are actually closer to the image than the rods and cones are. Light has to penetrate through all those cell layers to hit the rods and cones. Those cell layers filter the light, so it's dimmer than it was at the start. It's kind of like the eye's version of flying from San Francisco to San Diego with a stopover in New York. You still get to San Diego, but only after going thousands of miles out of your way. And because you went so far out of the way, you're tired and cranky and not feeling very bright. When rods and cones sense light, they turn off. Yeah, that's right. Off. In the dark, your eye is "on". In the light, it's "off". Which, in my mind, wins the award for the silliest of all the silly eye things. If I flip on the lights in my room, my rods and cones turn off. They stop inhibiting the RGCs, and the RGCs turn on. They then send action potentials to the brain, which interprets the message as light. If I flip the lights off, the process reverses. The rods and cones turn on and start to inhibit the RGCs. The RGCs stop talking to the brain, the brain interprets this as darkness. In pop culture there's a phrase: "Go into the light." If someone is dying in a movie, (usually in a hospital bed with no hope of recovery), they say, "I see a light!" and other people say, "go into the light!" The light is supposed to be the afterlife. It's not. I don't know if there's an afterlife, but I do know that "the light" isn't evidence of one. But "the light" is real. People who have near death experiences often report seeing a bright light. But what they're seeing is their rods and cones turning off as their eyes start to die. The rods and cones turn off, and the brain interprets this as bright light. I think that's a pretty neat factoid. As weird as the off/on thing is, it's also super cool. Like I said, the eye is a cobbled-together mess. But it's a fascinating cobbled-together mess. I love it. It's this sort of slap-dash path to awesomeness that is one of the things that makes me so excited to learn and teach about the brain.